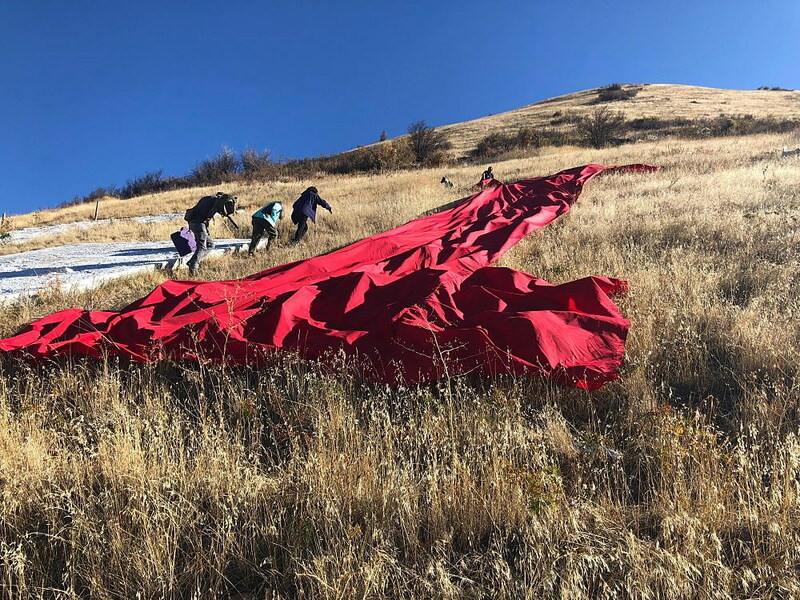 A group of protesters unfurled three 60-foot nylon letters on Mount Jumbo Thursday morning that – together with the mountain’s signature “L” – spelled out the word “LIAR” in protest of President Donald Trump. Trump sparked messages of protest across Missoula’s surrounding hillsides in the hours preceding his Make America Great Again rally, from “Dump Trump” on the North Hills to “IMPEACH,” with help from the “M” on Mount Jumbo. The idea spawned a few days ago, she said, when the group found out about Trump’s visit. While they aren’t part of a formal organization, group members wanted their voices to be heard. Other words utilizing the letter L, including love, were not strong enough to register the Missoula residents’ disdain for the president and his policies, Tschudi said. But not all Trump opponents – much less his supporters – agreed with the tactic. Some who oppose the president didn’t want Missoula to project a negative message. One “LIAR” group member even received a threatening phone call. And once the letters were in place, a Trump supporter wearing a holstered gun came up the hillside, vowing to bring others, like-mided individuals to tear down the letters. Tschudi said that Trump has denied climate change exists, an issue she cares deeply about, further giving meaning to the hillside’s message. “It seems like he undoes things just in a partisan way, not based on anything or in a pro-business way. Climate change is so grave,” she said. In a public statement, the group explained their motives behind the large fabric red, white and blue letters. Rosanne Davis, a Missoula resident, said that she’s upset about planned and proposed cuts to Social Security and Medicaid, and believes such policies are a disservice to the most vulnerable communities. She is also upset about immigrant children being held in detention camps in Texas. “As a parent, I literally had nightmares and cried over the abuse of immigrant children, because I know about stages of development. If you’re removing toddlers from their parents, that is going to permanently impact them in their development socially and emotionally,” she said. Voting is the only way to make your voice heard and make change, Davis said. “That is every citizen’s responsibility. As a citizen of this country, we have the privilege and the right to vote,” she said. About 75 to 100 people are expected to visit the hillside throughout the day. Marilyn Marler, one of the caretakers for Mount Sentinel, advised against groups using banners and other forms of protest on the M. She succeeded for much of the day in keeping messages off Sentinel, including a profanity early in the day. Around mid-day, social media showed photos of a giant illustration of a peach sitting atop the M, but that too quickly disappeared. By afternoon’s end, however, the “M” was transformed into “IMPEACH” and that message was not immediately removed. 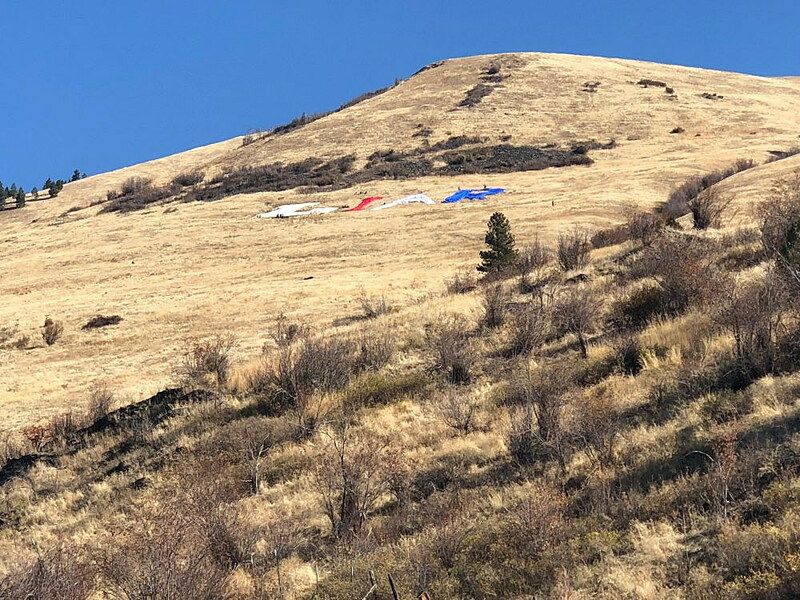 The first message displayed on a Missoula hillside Thursday came early in the morning via a “Dump Trump” sign made of sheets on Missoula’s North Hills. The sheets were later collected into heaps so the message disappeared. On Mount Jumbo, Tschudi explained that the group plans to remove the letters at the end of the day, and promised to respect the land. A botanist who plans to hike up Mount Jumbo, said that during this time of year, walking on the plants does little harm. Displaying the letters is important, and the message that needs to be broadcast through the valley, Tschudi said. She wants onlookers to think about what they believe in and what’s the truth when it comes to the president. People are concerned and upset, she said. “I want them to stop swallowing those lies and I want Trump to know that we see him, and we’re going to call him out,” she said.